Who doesn’t love summer peaches and blackberries? I know we sure do, as does our girl Audrey, who informed me she could live off of fruit if she had too! Our Father’s Day dessert for my father and husband was a peach and blackberry cobbler Audrey created from our frozen peaches from the year before and some fresh blackberries from our local orchard. The peaches already had some sugar added to aid in the freezing process, and along with the blackberries, they had just enough sweetness. The topping was made out of a Pillsbury Butter Recipe Cake Mix, one stick of butter and a tad of sprinkled cinnamon on top. The cinnamon is optional, but we think it gave the cobbler an extra kick. 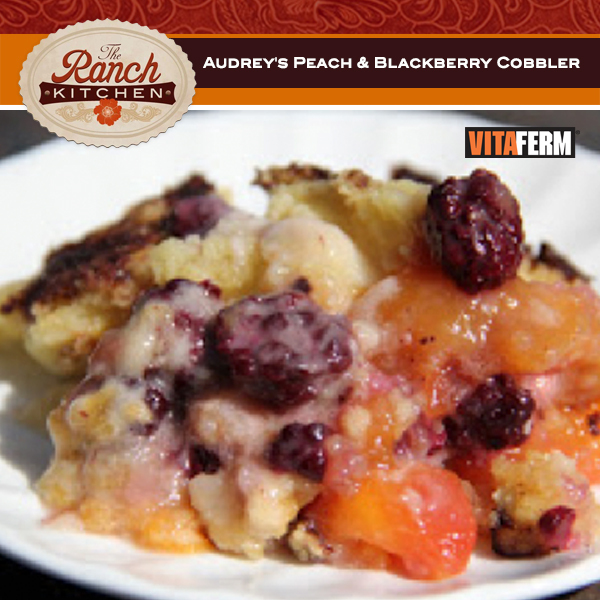 I’m sure there are many variations of this recipe and you could use most soft fruits and berries to make this cobbler. Canned fruits in light or heavy syrup would work well too. You can also make this cobbler recipe easily in your crock pot by just baking on low for six hours or on high for three hours. Audrey cooked this for 35 minutes on 375 degrees and we served it warm. It’d be fantastic with vanilla ice cream. However, since we’d had a huge meal of ribs, okra, purple hull peas and fresh garden tomatoes, the cobbler was just enough. We were stuffed! We hope you’ll give this cobbler a try. It’s so easy to make that a budding young cook like our Audrey had no problem making it all by herself! It was the sweetest thing watching her tell everyone that she made this cobbler. Happy Summer everyone and hope yours is as sweet as this cobbler! Spray or grease a 9 x 13 inch glass dish with oil. Place in peaches with syrup. Add blackberries making sure to spread thoroughly on top of peaches. Sprinkle one box of yellow cake mix on top of fruit mixture. Dot with cubes of cut up butter. Sprinkle top of cake mix topping with cinnamon (optional). Bake at 375 degrees until topping is slightly browned for 35 minutes. Goes well with vanilla ice cream! Refrigerate after serving.